According to the New York Times, the city has forked out more than $500,000,000 to settle allegations of police brutality and misconduct among officers of the New York Police Department. This staggering sum has accumulated over the last five years, and it does not include any legal or administrative costs; however, the NYPD remains embroiled in thousands of lawsuits every year. The NYPD has an internal department that investigates complaints against its officers. An internal complaint forces the police department to scrutinize the behavior of its officers; however, you will not receive any information about the investigation until the case concludes. Furthermore, this approach is unlikely to result in satisfactory discipline or termination of the officer in question. In most cases, the department rarely finds fault for human rights violations because of the fear of a lawsuit. As a result, the agency may discipline the officer for a lesser violation, such as failing to report the use of force or causing injury to the suspect. If the investigation finds the officer guilty of violating your civil rights, he or she can appeal the decision and avoid disciplinary action if successful. In many cases of police misconduct, criminal laws were broken. While the police may use force to arrest a suspect, it is a criminal offense to use force when it is unnecessary or to use more force than necessary to make an arrest. However, it is unlikely that the officer will face a criminal charge; grand juries seldom indict police officers, and juries rarely convict them. If a conviction does occur, the officer will likely receive a light sentence because of past good deeds. Additionally, there is some fear for the safety of police officers in prison, which contributes to their unsatisfactory punishment. If the officer appeals the conviction, a new trial may provide further relief from sentencing. The biggest advantage of filing a lawsuit is the protection your lawyer can provide you because he or she will represent your best interests. You have the right to require testimony from witnesses and other officers during your deposition, and your lawyer can request police documentation and other evidence to strengthen your case. A civil lawsuit allows you more control and participation in your case than a criminal or internal complaint, and if you win, you will receive financial compensation for your mental or physical injuries. A successful lawsuit sends the message that police misconduct is unacceptable in society, and it forces police departments to improve the actions of their officers with training and supervision. If you are facing criminal charges, you could benefit from discussing your circumstances with a criminal lawyer in New York. 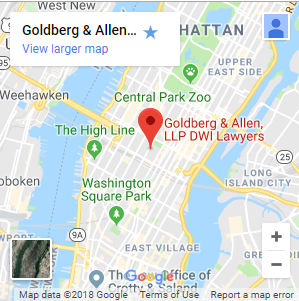 Goldberg & Allen, LLP, specializes in fighting police brutality. Call 212-766-3366 today for a free consultation with an experienced DUI attorney.